Renting your own place is considered a rite of passage-after all, few people can afford to purchase a home as soon as they reach adulthood. Even so, many become stuck in a rut and continue renting year after year despite having established themselves. If you are one of them, here are five reasons you should cut ties with your landlord and consider homeownership. Believe it or not, purchasing a home could actually save you money, even after factoring in expenses such as tools, maintenance, and lawn equipment. With today’s low interest rates, mortgage payments are often lower than the average rent cost in a given area. Buying a home will also provide you one other financial advantage-the ability to write off interest and other expenses on your taxes every year. If you have ever wanted to adopt a pet, plant a garden, or simply change the color of paint on your walls, you have probably met resistance from your landlord. And making major changes such as re-facing kitchen cabinets or knocking out a wall is definitely out of the question. When you are the homeowner, you don’t need to ask anyone else’s permission to do the things you want to do. Since your home is your castle, shouldn’t you be able to act like it? Regardless of how long you rent, you will never see any return on your investment. In fact, you’ll be lucky if you even receive your deposit back. That’s not the case when you buy, as every month you are building just a little bit of equity that you can receive back whenever you sell. That equity can also be used as a line of credit if you ever find yourself falling on hard times. Just because you have a lease does not mean you can stay in your current home indefinitely. Suppose your landlord decides to sell that house or get out of the rental business entirely. Maybe he or she would like to move back in or allow a family member to do so. Any of these circumstances could send you scrambling for a new place to live. If your area is already facing a housing shortage, this could be an especially big problem. Despite numerous changes in the housing market over the years, home ownership is still considered part of the American Dream. It is used as a measure of success, and is often treated more favorably than renting when applying for other loans. You’ll have a sense of pride when you tell others you have finally achieved the lofty goal of becoming a homeowner. These are just a few reasons to get out of your rental property and into your very own home. Once you do, we think you will find that there are actually quite a few others we failed to list here. 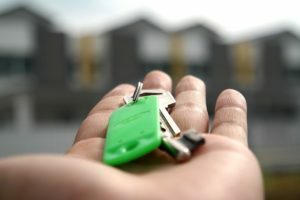 This entry was posted in Blog and tagged buying a house, renting a house, renting vs buying by Scott Li. Bookmark the permalink.